In October I broke down and took my cat to the veterinarian. The law required a rabies shot. The professionals at the vet clinic expanded that one shot to include a couple other shots, treatment for fleas and ear mites I didn’t know he had, and a schedule for neutering. Adopting a stray cat gets expensive. After talking with the vet, so does feeding him. Prince had been eating a cheap brand of dry cat food. The vet explained why a meat-eating animal finds it hard to get adequate nutrition from a mixture of cornmeal and packing plant waste products. In trying to get adequate sustenance from dry food, Prince would probably become overweight. 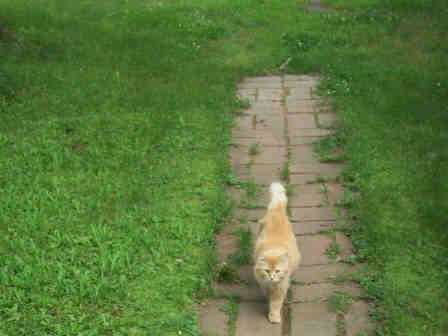 Besides, he’s an outdoor cat and needs all the help he can get as he faces a Wisconsin winter. I drug my heels a bit. After all, this cat moved in on me. I work for modest wages. I didn’t need another regular expense. I’d at least wait until the current bag of dry food was gone. Yep. Before the dry food ran out, I compromised. He’ll get a bit over half the recommended amount of canned food and finish off with as much dry food as he likes. Of course, he’s also getting a higher quality dry food. That stupid cat just plain hijacked me. A nearby store stocks a decent brand of canned food at a price I can afford. I bought three-and-a-half week’s supply and a new cat dish. Then, came the day when I opened the first can. Prince got excited. Normally, he’d nibble on his dry food off and on throughout the day. Not so with the canned food. He typically gobbles the whole five and a half ounces in one sitting. He sometimes even stands on his hind legs as I open the can. The old food was more-or-less adequate. The new food is a delight. Actually, the new food impresses me too. The old dry food smelled like rotting meat. The better dry food smells like vitamins. Canned food smells like meatloaf. I haven’t tried the stuff myself, of course, but it must taste pretty good. The story of one cat’s changing diet probably seems pretty irrelevant to everyone except cat lovers, but it does lead to thoughts about human nutrition—human spiritual nutrition to be precise. For the last several years, I’ve taken Bible college correspondence courses. Before that, I briefly studied theology at the seminary level. I teach adult Sunday school and do enough pulpit supply preaching to get a sampling of Sunday schools in other churches. Most of my training has been in good, conservative, Bible-believing schools. I have a pretty good idea what my church, my denomination, and the rest of the Christian world stand for. I’m well versed in it, and it is spiritual food, enough to keep a Christian going. I suppose it qualifies as pretty good soul food. Last Sunday, somebody opened the can. I heard a layman friend from another denomination preach. Now, I disagree with his church, but I briefly considered changing denominations after his sermon and a short afternoon of fellowship. Why? Because I smelled real spiritual meat instead of ground up leftovers in cornmeal. How was Sunday’s spiritual menu different than all the respectable Christian training? My friend goes simply and directly by the Bible. He tries to live it. He preaches it. When he preaches, he talks about how it has impacted his life. The Bible isn’t just something my friend reads books about. It’s his life. I like to think I preach Biblical sermons too, but the difference in his theology of experience and my theology of academics was sobering. Which brings back the quality thing. I do well in the academic world. My studies have helped keep me alive for years. I like to think I’m reasonably spiritually healthy--until I smell simple reliance on God’s Word. Then I know what I’ve been hungering for. I need the real thing, not church-house floor sweepings mixed with intellect. I need reminded that God’s Word is for all time. Whatever my culture, it is a reliable guide. It is a reliable guide, not just regarding my salvation, but for living my life. I need to think less about who said what concerning a text and spend more time reading the text. God’s voice is always in the Scriptures. It isn’t always in the commentaries. I need more than the church’s philosophical history. I want the true meat of God’s Word filling me all the way to the inner man and beyond. I’ll probably never get completely over formal, academic Christianity. But please understand when I climb up on the nearest chair, peak over the counter, and drool over a fresh, pure serving of God’s Word. For the latest developments concerning my cat and his diet, please see My Cat's Food Is Eating His Food.